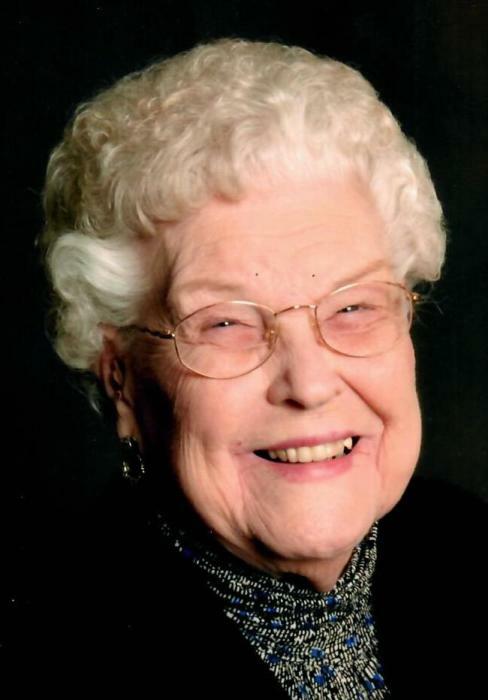 Lou Alice Clark, 90, of Yorktown, returned to her Heavenly home on Saturday morning, November 10, 2018 at the caring and loving community of Morrison Woods Health Campus following a brief illness. Lou Alice was born December 7, 1927 in Soldier, Kentucky to the late Earl and Bertha (Patrick) Miles. She graduated from Soldier School in 1945 and went on to attend Morehead State University before returning as a teacher at Soldier School. Lou Alice worked as a substitute teacher at Yorktown Schools after moving to Indiana in 1949. She was a devoted follower of Jesus and attended Union Chapel ministries and numerous bible study classes. Lou Alice was also a member of the Thrifty Thirty Home-Ec Club. She enjoyed quilting, cooking, and gospel music. Lou Alice was blessed with a large and loving family. She married Arthur J. Clark on July 30, 1949 and they commemorated their 50th wedding anniversary on the day of his passing on July 30, 1999. Lou Alice is survived by her two daughters, Rhonda Sponcil (husband Ollie) of Greenfield, OH and Leslie Hatcher (husband Michael) of Muncie; five grandchildren, Ray Sponcil (wife Melissa) of Greenfield, OH, Jamie LaMotte (husband Steve) of Minneapolis, MN, Allison Hubbard (husband Byard) of Yorktown, Jessica Hatcher of Huntington, IN, and Grace Hatcher of Indianapolis; four great-grandchildren, Cade Sponcil, Noah Sponcil, Jake LaMotte, and Olivia Grace Hubbard; a brother, Fred Miles (wife Janey) of Washington Court House, OH; a sister-in-law, Cathy Miles of Greensboro, NC; and several nieces and nephews. Lou Alice was preceded in death by her parents, husband, and a brother, Robert Miles. Lou Alice was a wonderful wife, mother, grandmother, and friend. Her prayer support was a blessing to all who knew her. She was a Godly example of Jesus’ love. A funeral service to celebrate Lou Alice’s life will be held at 1:00 P.M. Wednesday, November 14, 2018 at Gant Funeral Homes, Yorktown Chapel, 2215 S. Broadway St., Yorktown, IN 47396. Burial will follow in Hawk Cemetery. Friends and family may gather to share and remember from 5:00 P.M. until 8:00 P.M. Tuesday, November 13, 2018 and also one hour prior to the funeral on Wednesday at Gant Funeral Homes, Yorktown Chapel. Lou Alice loved babies and would like memorial contributions, in lieu of flowers, be given to First Choice for Women, 3020 N. Oakwood Ave., Muncie, IN 47304. The Gant and Miller families are honored to celebrate Lou Alice’s life with her family and community.